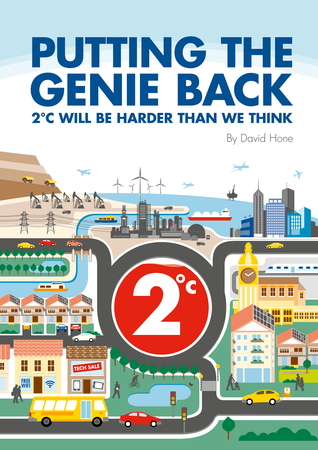 Very recently WWF released a new report which argues the case for a near 100% renewable energy system by 2050 (I remain optimistic with regards my longevity) as a solution to the environmental issues and resource depletion associated with the current energy mix. This would also eliminate the need for a shift to nuclear and the use of CCS as potential means to reduce emissions. The report is supported by an analysis produced by Ecofys, a Dutch consultancy focusing on sustainable energy solutions.
. . . we discuss methods of addressing the variability of WWS [wind, water, sun] energy to ensure that power supply reliably matches demand (including interconnecting geographically dispersed resources, using hydroelectricity, using demand-response management, storing electric power on site, over-sizing peak generation capacity and producing hydrogen with the excess, storing electric power in vehicle batteries, and forecasting weather to project energy supplies), the economics of WWS generation and transmission, the economics of WWS use in transportation, and policy measures needed to enhance the viability of a WWS system. We find that the cost of energy in a 100% WWS will be similar to the cost today. We conclude that barriers to a 100% conversion to WWS power worldwide are primarily social and political, not technological or even economic. Assuming that such an outcome is achievable (and I imagine that many would contest this, but not here, not now), then the real focus has to be on the timeline. In a 2009 post I explored the impact of a “trillion tonne” carbon budget on the energy system. Today (mid-February 2011), according to the researchers who put forward the idea, we have consumed some 545 million tonnes of the budget. With emissions today from fossil fuel use, cement production and land use change running at some 10 billion tonnes carbon per annum and including a global plateau in emissions for the next 10 years before reductions really start in earnest, society would have to reduce this to zero by 2090 to come in on a trillion tonne budget, assuming a linear decline. To have a 75% chance of keeping within a 2°C temperature rise, the budget drops to 750 billion tonnes (from a trillion) and the end date becomes 2041. In the latter case, a 2050 goal becomes very important. But 2050 presents an immensely challenging timeline to transform the global energy system. 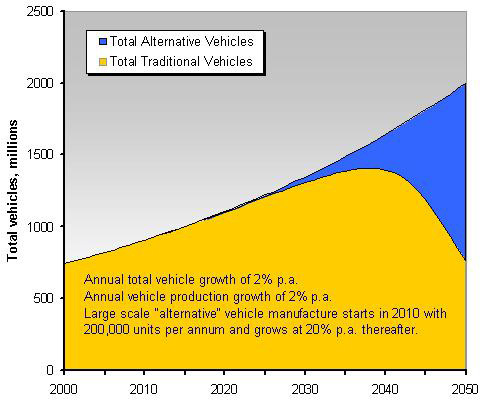 For example in 2005, for a World Business Council for Sustainable Development (WBCSD) publication called Facts and Trends to 2050, I developed a simple model to illustrate the rate at which alternative fuel vehicles would have to be developed and deployed to completely replace the global fleet by 2050. WWF/Ecofys have done this by shifting to an all-electric fleet in their study. 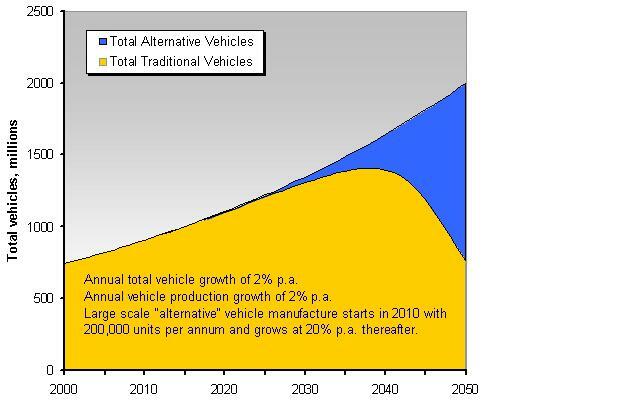 We assumed the availability of a zero emissions vehicle from 2010, with 200,000 units produced in that year and growing at 20% per annum thereafter until all production globally is switched. That doesn’t occur until about 2040, with full substitution on the road being a 2055-2060 outcome. But it is now 2011 and although there is a potentially viable electric vehicle (the Nissan Leaf) available, production this year is set for a maximum of 4,000 units per month. We need five Nissan Leaf type production lines this year and adding 2 per annum through to 2015, then 3 per annum and so on to get to 30 major production lines by 2020 and 200 by 2030. The power sector will be equally challenging, but there is some room for optimism. The WWF / Ecofys report has global wind energy rising from 1.2 EJ/annum in delivered power in 2010 to 7.2 EJ/annum by 2020 and 15.6 EJ/annum by 2030. This means some 80,000 5 MW turbines will have to be added globally over the next 10 years, or about 40 GW per annum. According to the World Wind Energy Association, global capacity rose by nearly 40 GW in 2010. But as noted in the Stanford paper, grid development must match this as the interconnection requirements to overcome the problems of intermittency and supply / demand balance, especially in a world without fossil fuel backup, becomes essential. Storage development and deployment also becomes paramount as renewable energy use grows, yet this technology remains in its infancy, at least on a large scale. As noted in a December 2009 post, development and deployment of a new technology is a multi-decade effort and there is almost no evidence in history that gives confidence this can be otherwise. Many sectors of industry are supporting major effort to get CCS up and running, yet after 10 years of effort only a handful of modest projects exist globally and there is no single example of what is actually needed, a large scale CCS project linked with coal fired power generation. A further major feature of the WWF report is the assumption that energy use peaks in 2020 then falls back to below 2000 levels by 2050, all while 9 billion people enjoy access to energy and an increasingly comfortable lifestyle. This is delivered through a massive improvement in energy efficiency in every sector of the global economy – one that far outstrips current year on year improvements. Not only will strict efficiency mandates be required, but society will also have to avoid the inevitable rebound effect (Jevons Paradox) that is bound to happen in many sectors that become super efficient. As the report notes, all this requires a comprehensive global policy framework with high carbon prices, significant support for technology development, tough building codes, efficiency mandates and so on. The EU is perhaps the most developed in this regard, but the policy framework in place today has taken 10 years to implement and is not fully functional. 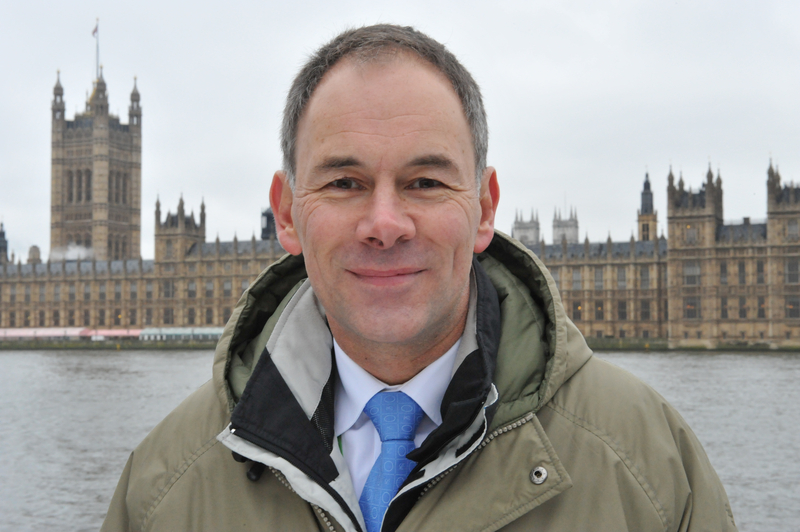 With a carbon price at €15 its effectiveness is also being questioned. Gaps remain as well. Internationally, the Kyoto Protocol was agreed nearly 15 years ago with a framework that positively encourages carbon markets, a price on carbon and carbon price incentive instruments to help developing countries get going. Yet it is clearly faltering and almost certainly won’t be built on, rather, a more national based architecture is emerging. But allowing that to bed down over a further 15 years isn’t conducive to a 30-40 year timeline to actually complete the whole job. The WWF / Ecofys report outlines a particular pathway forward for addressing global emissions – there are certainly many others. But all will require a focus on policy and social change that collectively we are not even close to reaching.